Are We There Yet?? : Oh Deer! It's a Tree! Martha Stewart would be horribly disappointed in the pathetic amount of holiday decorations at my house but considering I don't expect the Domestic Diva to be popping in for eggnog anytime soon I'm not going to worry about it! 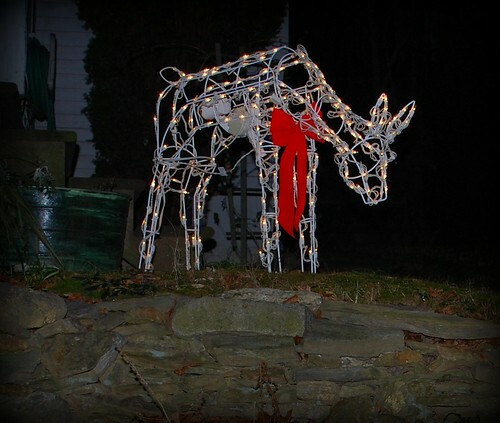 I spent the majority of today (the first Saturday I've had off in a very long time) trying to clean and de-clutter the house enough to at least put my light-up deer in front of the house and take my 3-foot pre-lit fiber optic tree out of its box. Mission accomplished and now my back is aching like I've been run over by a miniature sleigh and eight tiny reindeer! Ah well, at least there are a few Christmas decorations up and Jamie won't arrive home on Thursday thinking her mom has turned into the Grinch ... yet! Hey, I'd call that decorated! I don't have much more than that done myself. Thanks for your kind words about Parker kitty. Today has been rough, but tomorrow will be a better day. We sure miss him! Don't crank that heating pad up to high or you'll be Fiberoptic yourself. Oh dear, I hope your back feels better soon, Linda. My tree is not up, nor are my 3 Reindeer down from the attic and our on my front lawn. That has nothing to do with a lack of Christmas Spirit - People are more important than Christmas traditions... I didn't want my 80 year old Dad lugging them down from the attic again (or having to drag them back up). We are also not putting up lights on the house because I don't want to see him and my 73 year old friend on ladders again. I could do it myself... but my Dad would not sit still for it, so the graceful way out is to say I just didn't want to go to all the trouble this year. One a Christmassier note, one of my sisters and her hubby are in Boston this weekend seeing The Grinch! Even with the Ice Storm, they made it! I'd barely ever go out if I still lived up there! Brrry cold! A very commendable job... Brava!! 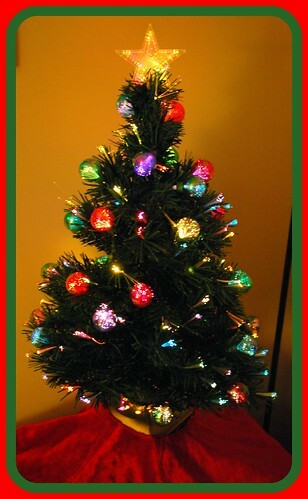 haha ~ I just posted a photo of my little ornament tree in the kitchen before I saw your post. You are ahead of me in the decorating. We have nothing outside, not even a wreath. Hope your back is better today, Duchess Linda. We have minimized our decorations this year. We have our Santa bear and our stockings. And our Santa hats. Not even close to Grinch-dom yet. Your daughter probably won't even notice if she's anything like my kids were as teenagers.